Lottie leaks. 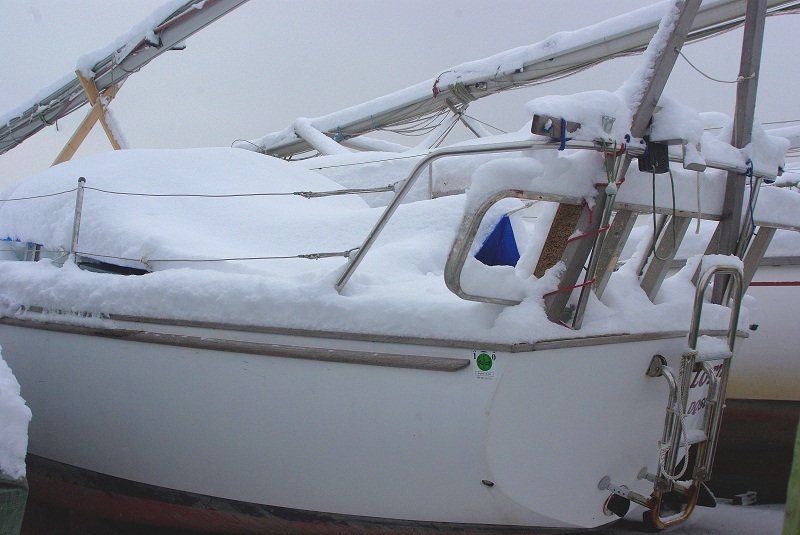 Not badly but when ashore for the winter, especially when facing into the prevailing winter storms, water can get blown under the front of the main hatch. Water from aft also seems to percolate around the main hatch boards in a downpour. And Lottie‘s cockpit floor hatch is so leaky it might as well be a funnel. Her cockpit woodwork is not improved by all year round sun, rain, frost and snow either; freezing water can split open any tiny cracks. So in the winter she dons a cover. We started off using the sort of cheap blue polythene builders tarp you can get for a few pounds from B&Q and the like. But they rarely lasted one whole winter. They easily wore into holes and the eyelets pulled out. And a ripped cover that flaps is worse than no cover at all. has very tough corner eyelets and so far this one has lasted 2 winters and looks fit for another at least. So its working out cheaper over time. Of course you have to avoid or pad any sharp corners or fittings that would soon wear a hole in any cover. We use just a 3mx2m size to create a low profile cover that just covers the main hatch and keeps the cockpit completely dry but aired. 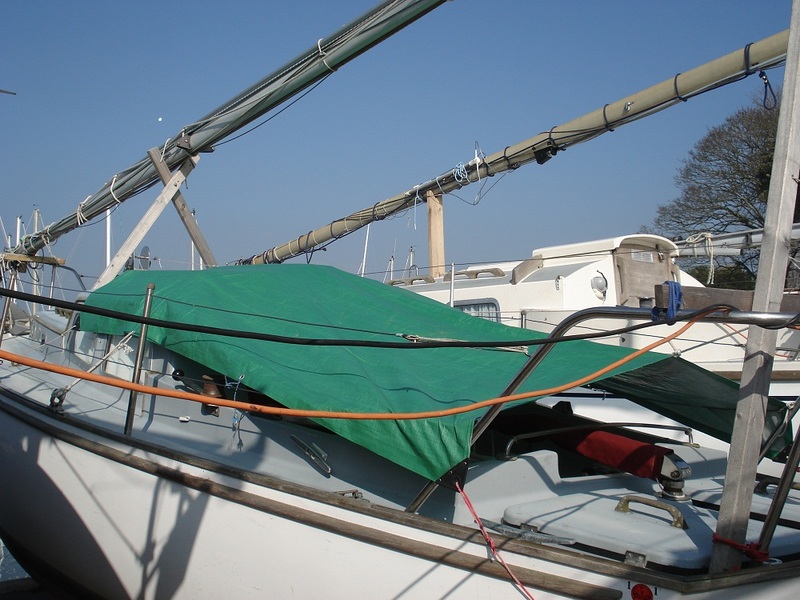 We could use a bigger cover like a ridge tent over the horizontal mast but that seems to be asking for trouble in winter storms. If the cover didn’t rip it would likely have the mast over the side. 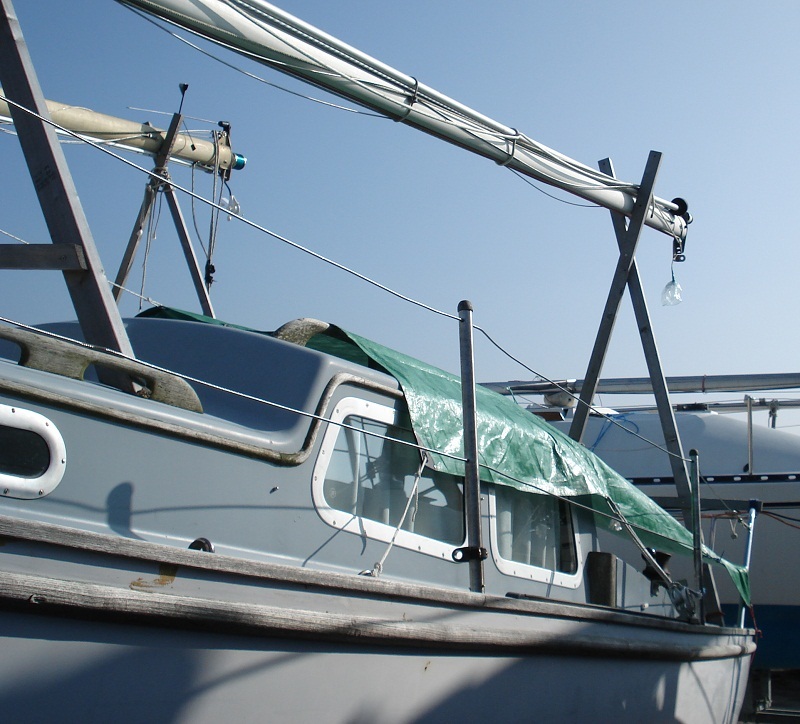 As it is we have to lash the bases of our mast crutch at the stern to stop it walking off the deck when the wind rocks it. 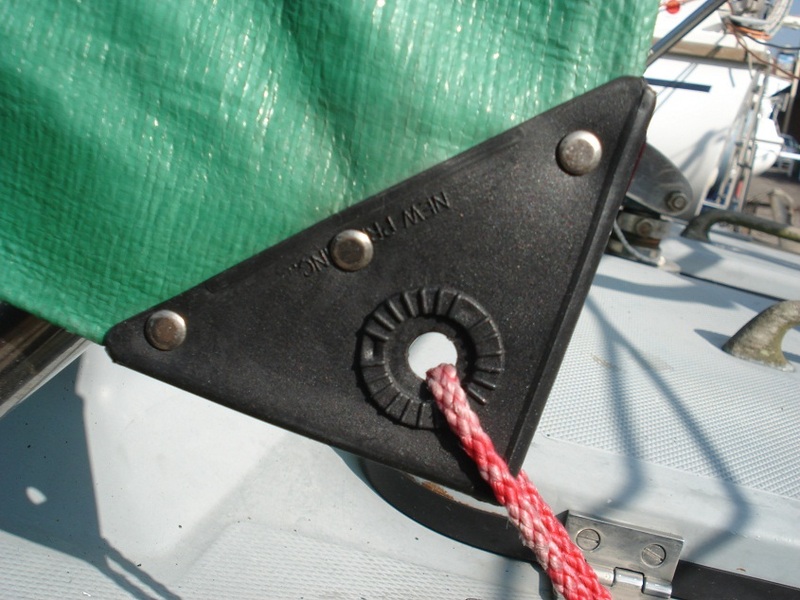 And that is without a cover acting as a sail. The smaller cover can be temporarily rigged over there on those days we need a dry cockpit to work in. Ties forward to the tabernacle and aft to the pushpit creates a ridge that sheds the water each side and side and corner eyelets secure it all round. The first year I actually inserted a ridge pole but found it wore away at the underside of the cover.